Dell is quite famous for their direct-sales business model. 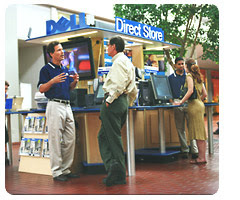 A customer can buy Dell products only via their online web store or through the telephone. Though there are some Dell retail outlets, they are just to help "prospective" customers try out Dell products and order them for delivery just like they would do over the phone or internet. Customers cannot walk out of Dell stores with products. However, the situation is expected to change soon. Last month, Michael Dell returned to the company as CEO and the company is now looking to expand their options beyond direct-retail. Reuters reports (via CNN) that you may soon find Dell computers on retail shelves and can even walk away after purchasing them, an option not available earlier. Dell said the company remains committed to its 23-year policy of selling directly to customers, but is open to "experimentation." Dell has struggled with slowing growth for two years as prices declined across the industry, reducing the price advantage afforded by Dell's direct-sales strategy. This could be the next major decision by Dell after they decided to sell Naked PCs, a step that may not have gone down well with long time partner - Microsoft.